There’s a reason why we’re called Skyline Cruises. We’re in our 25th year of cruising past some of the most iconic skyscrapers in the world. If you book a trip aboard the Skyline Princess, our 3-deck luxury yacht, you can view Manhattan’s most famous buildings including, the United Nations, Chrysler Building, Empire State Building, Woolworth Building and One World Trade Center. And let’s not forget the culmination of many of our cruises at the Statue of Liberty. But that’s not all that Skyline Cruises has to offer. With Skyline Cruises, you can have an unforgettable day even if you don’t see a skyscraper. The Skyline Princess is more than a place to view famous buildings. We’re also the perfect venue for any event or celebration you may be planning. We’re the most unique wedding spot in New York City and we can help you plan a wedding at sea presided over by our longtime friend Captain Arnold. You can plan your corporate events with us, or you can book us for celebrations like Anniversaries or Bar/Bat Mitzvahs. We’re perfect for any occasion. Our public cruises leave from our home dock at the World’s Fair Marina in Flushing, Queens. But we offer full ship charters from several ports around the tri-state area. When we leave from Westchester, New Jersey, Connecticut, elsewhere on Long Island or even from Flushing we want to tell you how we can design a spectacular cruise that doesn’t involve the Manhattan Skyline. If you plan a full ship charter that leaves from Queens, Long Island, or Connecticut, we can take you on a scenic tour of the Long Island Sound. 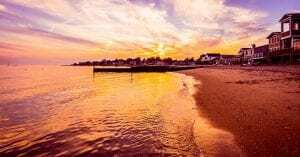 If you’re a Connecticut or Long Island based company looking to beef up your annual corporate outing or you want to add a touch of beauty to your celebration, we can show you the incredible sights of Connecticut’s gold coast or the lighthouses and history of Long Island’s Sound Shore. You’ll see mansions and private islands with incredible architecture and the stunning homes of Connecticut. You’ll see lighthouses on a cruise through coastal Connecticut. You’ll also pass lighthouses, mansions plus historic forts such as Fort Schuyler in the Bronx and Fort Totten in Queens. If you book a Skyline Cruise from one of our Westchester or New Jersey docks we can give you spectacular views of the Hudson River including the George Washington Bridge, the Cloisters, and the famed Little Red Lighthouse which inspired the beloved 1942 children’s book “The Little Red Lighthouse and the Great Gray Bridge.” On the other side of the river, you’ll see the stunning Hudson River Palisades which have been preserved since the late 19th century. In addition to all the sights you’ll see, the Skyline Princess has all of the amenities. It is climate controlled and leaves all year round. The top deck, known as the Skylight deck has a dance floor and a DJ space. The other two decks can be used as a dining space, or the perfect spot for a cocktail party. All of our food is prepared by our onboard chefs. If you’re looking for a theme like a casino night or want the space to hold a fundraising auction or business meeting, the Skyline Princess has it. Whether you want to see the skyline or just explore, contact us today!